Milk and cookies. Just the mention of this classic snack brings a smile to your face, doesn't it? What kind of cookie do you like to have with a glass of milk. Chocolate chip? Oatmeal? Peanut butter? What about all of these favorites from cookiedom rolled into one? If the idea of an all-in-one cookie piques your curiosity then let me recommend Chunk Wild cookies. Oats, walnuts and three different kinds of chips ... oh my! I found the recipe for these delightful treats about 7 years ago on King Arthur Flour's web site. 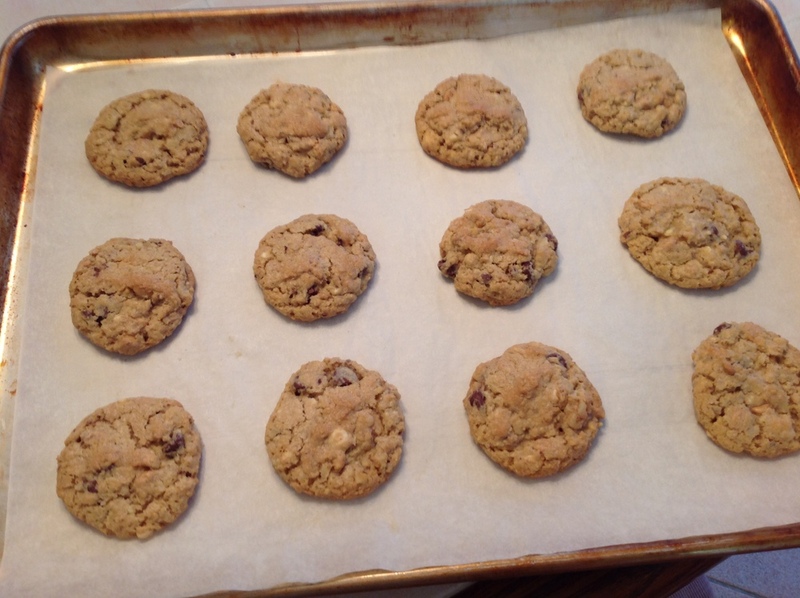 In addition to the usual ingredients you would expect in a drop cookie (i.e.- butter, flour, granulated and brown sugars, eggs, salt, vanilla, leaveners), Chunk Wild cookies also include old fashioned oats, walnuts, semi-sweet chocolate chips, white chocolate chips AND peanut butter chips. I was intrigued not only by the ingredients but also by the back story for the recipe. According to King Arthur Flour's P.J. Hamel in her 2008 blog post about these cookies, this recipe was created by a young baker from Montpelier, Vermont named Sarah Nist. Ms. Nist entered her cookie creation in KAF's 1991 WinterBake contest and won the junior grand prize for her efforts. Dropped by rounded tablespoonfuls (using a cookie scoop - see my list of essential baking tools here), Chunk Wild cookies bake up big. Nothing delicate or dainty here - these cookies are, quite literally, a handful, perfect for dunking in a glass of milk. When you taste a Chunk Wild cookie, you will know why it won the junior grand prize. The old fashioned oats are ground up with the white chocolate chips using a food processor and then added to the cookie dough base. 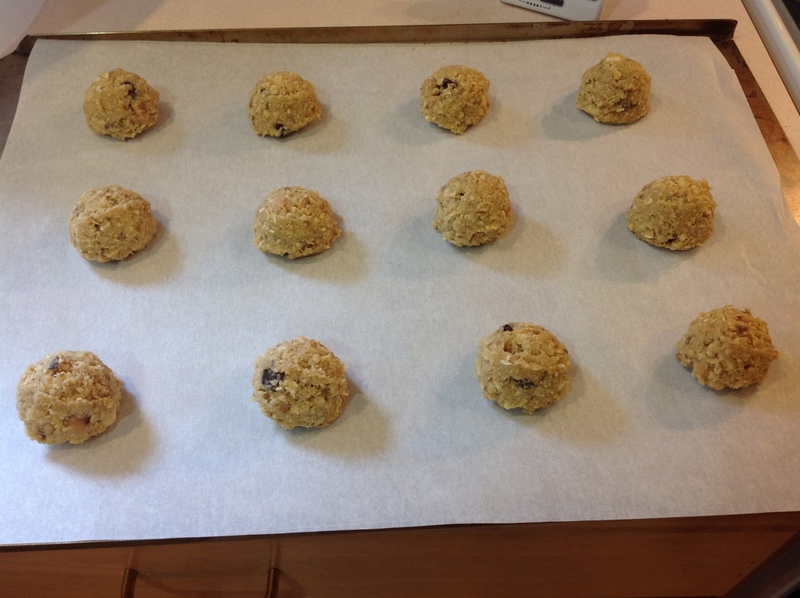 The oat/white chocolate mixture gives these cookies their heft and substance. And if you are thinking about omitting the white chocolate chips because you're not a fan of them (like me), let me just say this ... DON'T DO IT! The white chocolate in the base of this cookie creates the perfect canvas on which the walnuts, semi-sweet chocolate and peanut butter chips each shine to their fullest potential, complimenting each other in a way that is hard to put into words. Eliminating the white chocolate chips from the recipe yields a cookie that is just ... okay. I know because I tried it. 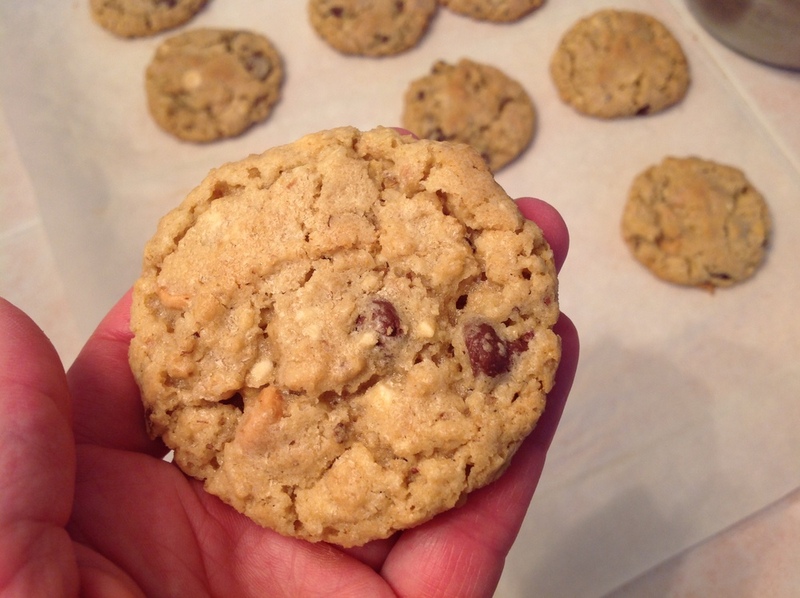 Prepared as directed by Sarah Nist in her recipe, Chunk Wild cookies are a masterpiece. So if you want to bake a batch of cookies but can't decide among chocolate chip, oatmeal or peanut butter, why not make them all?? Mix up a batch of Chunk Wild cookies. And as you reach for yet another cookie (because, believe me, you just can't help it!) raise your glass of milk and toast the youngster from Vermont whose idea it was to throw 'em all into the same cookie. Thank you Sarah wherever you are! !